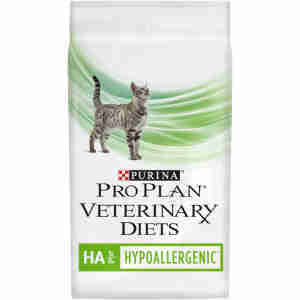 PURINA PROPLAN VETERINARY DIETS Feline HA St/Ox Hypoallergenic is great for helping your cat manage their food allergies. This is a nutritious and great tasting feed for cats and kittens. Ingredients: Rice Starch 1, Hydrolysed Soya Protein 2, Soybean Oil, Minerals, Hydrolysed Digest 2, Animal Fat, Fish Oil, 1 Carbohydrate Source, 2 Protein Sources. Nutrition: Analytical Constituents, Protein: 35.5 %, Fat content: 10.0 %, Crude ash: 8.0 %, Crude fibres: 3.0 %, Essential fatty acids: 4.0 %, IU/kg: Vit A: 35 000, Vit D3: 1 100, Vit E: 650, mg/kg: Taurine: 1 500, Ferrous sulphate monohydrate: 290, Calcium iodate anhydrous: 3.7, Cupric sulphate pentahydrate: 58, Manganous sulphate monohydrate: 120, Zinc sulphate monohydrate: 490, Sodium selenite: 0.34. My vet suggested i put my cat on this food. She may be suffering from IBS and we are doing a trial. Since she has been on this she has shown no signs of IBS and she loves the food. I have also tried it and its very tasty. MY VET RECOMMENDED THIS PRODUCT TO TRY AND HELP MY ELDERLY CAT WITH POSSIBLE IBS OR PANCREATITIS.THE PRODUCT WAS HIGHLY APPRECIATD BY MY CAT WHO DOESNT SEEM TO BE ABLE TO GET ENOUGH OF IT. I HAVE ALSO TRIED IT AND IT IS VERY LIGHT AND HAS A WONDERFUL FLAVOUR.PETSUPERMARKET THANK YOU FOR THE PRICE AND FREE DELIVERY OF YOUR ITEMS OVER £19.00. I WILL USE YOU AGAIN AND THE DELIVERY WAS WITH ME WITHIN 2DAYS.